Eric Ostroff talks about the impact artificial intelligence will have on the legal profession. Jonathon Israel: Hello and welcome to The Florida Bar Podcast brought to you by the Practice Resource Institute on Legal Talk Network. This is Jonathon Israel, and I am the Director of the Florida Bar’s Practice Resource Institute. I am recording today from the 2018 Annual Florida Convention in Orlando, Florida. Joining me today I have Eric Ostroff, who is going to talk to us a little bit about Artificial Intelligence and its impact on the practice of law. But before we do that, I want to give Eric a chance to introduce himself. Eric, if you don’t mind telling our guests a little bit about yourself and your background. Eric Ostroff: Thank you, Jonathon. I am practicing at a law firm called Meland Russin & Budwick in Miami. We are a 15-lawyer firm. I focus my practice on business litigation and trade-secrets litigation, and you can check out my blog at HYPERLINK “http://www.protectingtradesecrets.com/”protectingtradesecrets.com. Jonathon Israel: Perfect. I appreciate that. so Eric, Artificial Intelligence I think that were beyond the disruptive stage now. I think we are into the stage where this is a must for attorneys to try and get into and figure out how this is going to — how they can implement it into their practice. Any tips you can give or guidance on somebody who needs to just get started and figure out where they go from here. Eric Ostroff: I totally agree with that and that was one of the primary points I was trying to make with my presentation is that Artificial Intelligence allows you to offer better quality legal services at a lower cost. And you basically have two choices, you either embrace it, in which case it helps you to become a better, more efficient lawyer, or you don’t, and then you are offering lower quality higher cost services vis-à-vis your competitors. So without question I think it’s mission-critical for all law firms, all lawyers to focus on advanced technology, Artificial Intelligence and figure out how to incorporate it into their practice. And if you are working at a giant firm, this is going to be less of an issue for you because they are going to have a staff and Chief Technology Officer, people whose jobs it is to actually stay on top of these things. But I work at a 15-lawyer firm, if you’re at a small firm, a sole practitioner, it’s totally on you. It’s totally on me to make sure I understand. So I think it’s important to look at what is your practice and where are the areas that Artificial Intelligence can help you. Jonathon Israel: Right. No definitely, I would agree with that. and I think it’s more of a augmentation more than it is a replacement, you are not going to go out and replace staff on day one with a robot or an Artificial Intelligence out there. It’s just figuring out how you can help yourself and your staff using Artificial Intelligence to make your firm more efficient. Eric Ostroff: Absolutely. I think that that’s — there was another point I made this morning is that this is a way to augment your practice. Eric Ostroff: We use Artificial Intelligence in the legal research context, we use it in the document production context, and I can talk in more detail if you want about that, but those are two areas where you see Artificial Intelligence making in roads are generally areas where lawyers don’t love to do their work themselves. Some people like legal research, a lot of people don’t, nobody likes document review. So, if you can take some of these less desirable aspects of practice of law, allow the robots to do it, leave the more intellectually interesting challenging stuff for us, that’s a good thing. Jonathon Israel: Yeah, great. And I think in your presentation you kind of gave some examples of services that are available today that lawyers can go out and start integrating AI into their practices, you might touching base on some of those in how and where they fit in and what they can do for. Eric Ostroff: Sure. Like I said, legal research and document production are to me the low hanging fruit, and we use a tool that’s called CARA by a company called Casetext, that does legal research, and it’s extremely simple, it’s literally drag and drop. You take a brief, you drag it and drop it onto their website, and it uses AI to find cases that are not cited in your brief that are relevant to the issue. So it addresses the problem of missing a case. Have I really exhaused all my research, am I missing a search term somewhere that’s going to find that key case, this helps to close the loop on that issue. It’s extremely cost-effective and the per user license fees are not that expensive. It doesn’t take a lot of time. It does the analysis in seconds, and we found on a number of occasions cases that we had and otherwise found that end up in the brief. You can also use this to do opposition research. So you take the other side’s brief, you throw it in there and sometimes surprise, they didn’t cite a case, whether on purpose or they just missed it. And that case doesn’t — that helps you not them. So we use it for that purpose as well. Jonathon Israel: That’s great. Beyond document review and contract review, where do you see the Artificial Intelligence going as a whole in the practice, do you see it transitioning to other areas? Eric Ostroff: Yeah, I think as the technology gets more sophisticated, it’s going to take on more and more aspects of the practice. One area that I think is absolutely right for innovation is outcome prediction, using data from past cases to predict what’s likely to happen in the future. So almost like Moneyball for lawyers, where if you know that if you are going to file a case in the Northern District of California and it’s a patent case, well, what’s the likelihood of receiving a favorable outcome, and even drilling down to in front of this judge and this type of motion, what’s your likelihood of success? And that type of data-based information I think can really help to guide decision making. I think that a lot of companies that are very data focused in a lot of areas, employment, are going to want lawyers who are going to be using data to help them make their decisions. I think that the era of just instinctual lawyer-driven decision making is eventually going to come to an end and it’s going to be a combination of data plus legal decision making before we get to a decision. Jonathon Israel: Yeah. No, I would agree with you 100% on that. We had a member benefit with a company called Ravel Law, that was recently acquired by LexisNexis, so there are definitely people thinking along the same lines as you. LexisNexis sees that route coming. Eric Ostroff: Yeah. I think the products that I have looked at thus far, and I haven’t looked at that one, but the products I have looked at thus far, they are not quite there yet, because it’s — you have to be careful before you are going to start guiding your decision making that what you are seeing is actually valuable information, because if not, garbage in, garbage out, and you don’t want to be over-reliant on the technology, so there is a balance. I haven’t seen anything yet that I am comfortable using, but I am sure in the very near future those products are going to be there. Jonathon Israel: Right. And that’s a good point. The algorithm is only as smart as the information that’s been programmed into it. So I mean how do you vet some of this? How does an attorney know that what they are seeing is the garbage in that’s good? Eric Ostroff: It’s all about reaching out to the vendors and they want you to use their products, so they are going to let you try it out. I know I tried out one analytic site and I was just surfing around with it and I noticed that the number of cases that it had being filed on a daily basis in the Southern District of Florida was just totally inconsistent with reality. So there was some flaw in the way that they were gathering data and that says to me, okay, I mean I like what you are doing here, but I can’t use this yet. You need to fix these problems. So you need to apply some commonsense. When you are looking at outcome prediction, you can see — a lot of these tools you can drill down and say, okay, the following number of motions have been decided by this judge and if you are looking at a 10-year period of a federal judge and they have only decided three patent cases, then something is wrong with that data, because chances are, unless you are in some obscure jurisdiction, there is something wrong with what you are seeing. Jonathon Israel: That’s good advice, yeah, definitely. Other areas that you can see with AI, I mean jury selection, do you see it going somewhere like that, helping you figuring out what kind of jurors you would want? Eric Ostroff: It’s an interesting idea. I mean at the end of the day it’s really about using data to try and help predict outcomes. So there is potentially some controversial issues that can go into there. There has been some controversy over how data can magnify biases. So jury selection is an extremely tricky endeavor and I would be very interested to see how that would work, how you measure the accuracy of the information you are using, because it’s such a black box process of a jury deciding a case, but certainly that’s a very interesting area. One thing I didn’t talk about was just how we use it for document review. Document review is brutal. It can be extremely expensive, it’s time-consuming. People don’t like to do it. It’s fraught with error, human error and it creates real problems for smaller firms because you can’t — you end up getting disqualified from handling document intensive cases just because you don’t have the personnel. But if you use, it’s called Technology Assisted Review or predictive coding, it basically allows for the computer to do at least the first cut of responsive, nonresponsive determination and it’s much, much faster, much more cost-effective, really powerful tool, particularly for smaller firms. Jonathon Israel: Yeah. No, I can definitely see that, if you are going after an insurance company or somebody like that who has got the resources to go through hundreds of thousands, if not millions, of medical records and you are a solo or a small firm, that’s definitely where an AI assisted document review would come in handy. Eric Ostroff: It also helps, if you have got a defendant who is saying, this is too burdensome for me, if you are representing the plaintiff and there is a lot of documents and they are saying it’s going to cost me too much money to review these million documents. You could say well, why don’t you use predictive coding? And I think the judges are receptive to using technology to mitigate these burdensome type arguments and it can end up getting you more than you might have otherwise gotten. Jonathon Israel: Yeah. And on the lines of predictive coding, are you saying that attorneys are going to have to know how to code in order to use this technology or do you think the services will be robust enough that they can kind of plug and play? The vendors realize that lawyers are not always the most tech savvy, so they are doing their best to make it as simple as possible. Jonathon Israel: Well, it looks like we’ve reached the end of our program for today. Before we let our listeners go, Eric, I want to give you a chance to let them know how to get in touch with you, if they have any questions or want to follow up on any of the things that we discussed today. Eric Ostroff: Sure. Like I said, I have Trade Secrets blog at HYPERLINK “http://www.protectingtradesecrets.com” protectingtradesecrets.com. My Twitter handle is @BlogTradeSecret and you can also reach me via email at HYPERLINK “[email protected]” [email protected]. Jonathon Israel: All right, thank you very much. 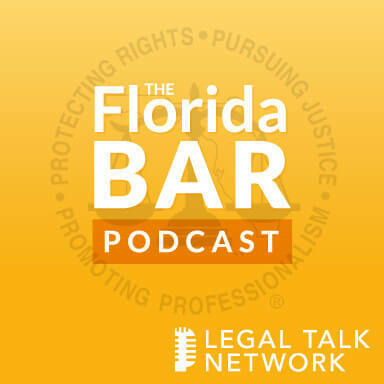 Jonathon Israel: Well, this has been another edition of The Florida Bar Podcast, brought to you by the Practice Resource Institute on Legal Talk Network. I want to thank our guest, Eric Ostroff, for joining us today. And if you liked what you heard, please find and rate us in iTunes. I am Jonathon Israel and until next time, thank you for listening. If you would like more information about today’s show, please visit HYPERLINK “http://www.legaltalknetwork.com/”legaltalknetwork.com. Subscribe via iTunes and RSS. Find The Florida Bar, The Florida Bar Practice Resource Institute and Legal Talk Network on Twitter, Facebook and LinkedIn, or download the free app from Legal Talk Network in Google Play and iTunes.